When was the last time you gave the trash can on your Windows desktop any thought? Not recently, I’m guessing. But if you take a closer look, you’ll find the humble Windows Recycle Bin has a few cool tricks up its sleeves. 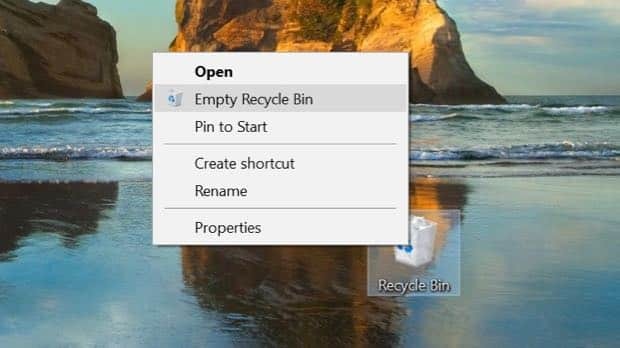 Read on for four gotta-try Windows Recycle Bin features, from making the recycle bin empty itself automatically to putting trashed files back where you got them. When you toss a file in the recycle bin, it doesn’t actually get deleted right away. Instead, it’ll sit in the trash—and take up space on your hard drive—until you empty it manually or until it hits a preset limit (which I’ll cover in a moment). 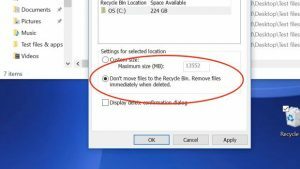 Just change a single setting to make the Recycle Bin delete files the moment they’re trashed. Of course, keeping trashed files on your system temporarily is a good idea in case you change your mind later. But if you’re positive you want to ditch a file right away, you can skip the recycle bin and delete it immediately. One way to do it is to right-click it, hold down the SHIFT key, and then select “Delete” from the pop-up menu. Want all the files you delete to be trashed permanently and skip the can? Right-click the recycle bin, select “Properties,” then click the “Don’t move files to the Recycle Bin” option. Let’s say you do want to temporarily keep deleted files in the recycle bin. That’s fine, so long as you remember to take out the trash once in a while. But who wants to bother with that? Me neither. 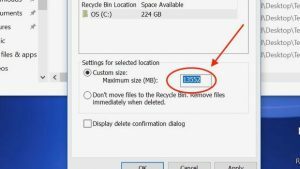 The recycle bin will empty itself automatically once you set a maximum size. Well, you can always set a size limit for the recycle bin. Once the total size of your deleted items hits the limit, the recycle bin will automatically toss the oldest files. Make sure the “Custom size” option is selected, then choose a maximum size—anything up to the total size of your hard drive. Click the “Apply” button, then click “OK” to close the settings window. You’re done! So, you dumped a bunch of files in the recycle bin but you’re having second thoughts. Now what? You can restore everything in the Recycle Bin to their rightful place with a single click. You could just open the recycle bin, pluck the items out and drop them onto your desktop. A handy alternative, though, is to let Windows send the file back to its original location. 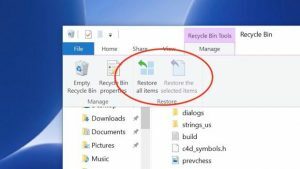 Just open the recycle bin, select the file you want to “un-delete,” click the Manage menu at the top of the recycle bin window, then click the “Restore the selected items” button. You can also click the “Restore all items” button to put everything in the recycle bin back where it was. Don’t want the recycle bin icon cluttering up your desktop? You can hide it in just a few clicks. Just check or uncheck the box to reveal—or hide—the Recycle Bin from your desktop. Now, see the Recycle Bin checkbox? Uncheck it, then click the Apply button; once you do, the Recycle Bin icon will disappear from your desktop. To get the Recycle Bin back (and remember, it’s not really gone, just hidden from your desktop), check the Recycle Bin box, then click Apply again.